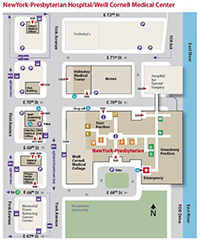 The Weill Cornell Brain and Spine Center has two offices near the NewYork-Presbyterian/Weill Cornell Medical Center on the upper east side of Manhattan. The hospital’s main entrance is located at 525 East 68th Street, directly east of York Avenue. You may reach the Starr Pavilion from the main hospital entrance or through the revolving doors at 520 East 70th Street. We also have offices in the Weill Greenberg building, which is located across York Avenue from the Starr Pavilion at 70th Street. Jump to the bottom of this page for directions to our upper east side campus. Our downtown location is at 156 William Street, 11th Floor. The closest subway is the 2/3 (Fulton Street stop); the office is also near the Fulton Street stops on the A/C and 4/5 lines. 1. Our pediatric neurosurgeons see patients at New York Methodist Hospital at 263 7th Avenue; Brooklyn, NY 11215. Our Bayside office (pediatric neurosurgery only) is at 26-19 Francis Lewis Blvd. ; Bayside, NY, 11358. By subway: Take the 6 train to the 68th Street/Lexington Avenue Station. Walk four blocks east to York Avenue, or take the M66 bus eastbound to York Avenue. The Weill Greenberg building at 1305 York Avenue is located at the corner of 70th Street and York Avenue. The Starr Pavilion entrance is located at 520 East 70th Street, just east of York Avenue. By car/taxi: Coming from the FDR Drive North, take the 61st Street exit and make a right turn onto York Avenue. Coming from the FDR Drive South, take the 71st Street exit and make a left turn onto York Avenue. Parking: Valet parking is available at the main campus on 525 East 68th Street entrance and at garages located on York Avenue between 68th and 70th Streets.